i feel i cheated as i purchased a reptile cord and thermostat as our other methods didn't maintain temp. is it best to have it cut out at 37.7 degrees or a bit higher and maintain the 37.7 needed? how close together can you put the eggs? i need to get 24 in, i tested the rack and they do fit and don't touch, but it's close. i might put 6 under my broody if she continues to sit, she is my most reliable. i have some barny eggs coming today, so excited. 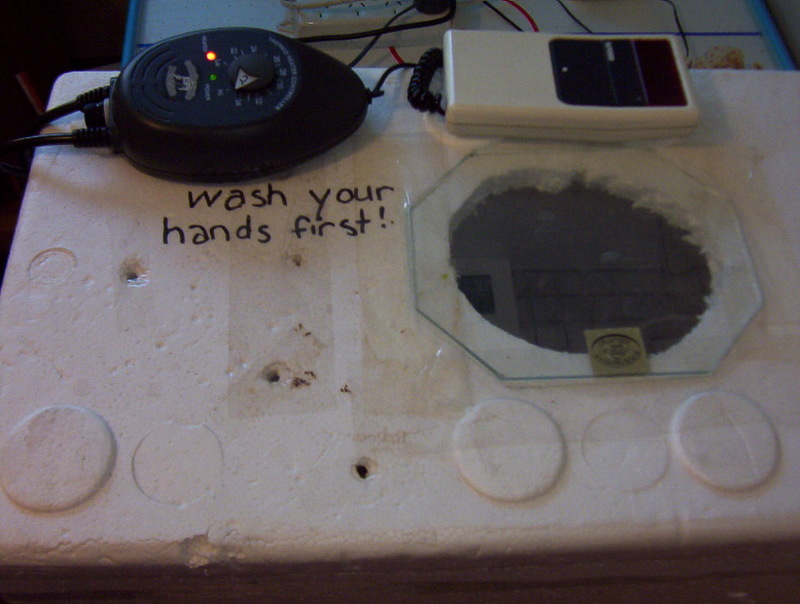 the "wash your hands" is a reminder for my kids. all 4 of them. Are you hand turning? Might also want to think about some sort of hatching tray to keep the chicks in something when they hatch or I can see them getting into the heating cord down the bottom. Is there some reason why the heating cord is on the bottom and not on the lid - because unless you are prepared to take it out each time you hatch, it's going to be a real bear to clean out the fluff and poop with the cord in place. Otherwise it's a top job! On the temperature issue specifically - its important to realise that the temperature within the incubator is largely irrelevant. 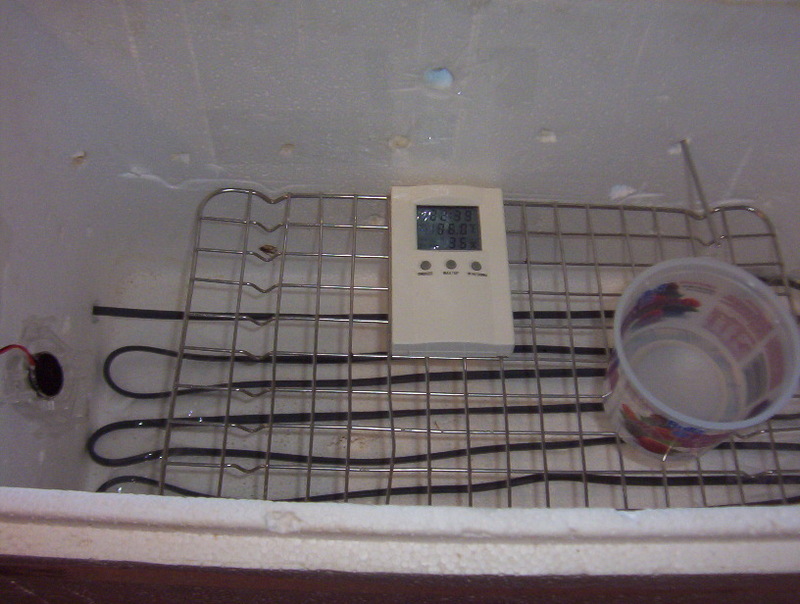 Its the core temperature of the eggs that is the important issue and they must at 37.5 (+/- 0.5 c). With a batch of eggs in the incubator you are better able to check the efficiency and consistancy of the incubator. It doesn't matter what eggs - even store bought ones. How do you measure the core temperature of the eggs - well you can't really but you can simulate it by creating an acrylic egg with the temp probe inside - or a plastic egg filled with rice grains - something along those lines. When you first put eggs in (hatchable or store bought wasters) the temperature is going to drop and it will be 24 hours before it comes up to the correct temperature again. Dont fiddle - the eggs soak up the heat causing the temperature drop until the eggs are the same temperature as the surrounding enviroment - just let them get there before making any adjustments. Then after 24 hours make your adjustments, if necessary - remember a dozen of a couple of dozen eggs takes a bit of heat supply to keep them at that temperature. i have a large deep plastic container to hatch in and another foam box to brood in and a large brooder (cupboard) in the shed for when they are a few weeks old. i didn't think about putting it on the lid, makes sense and eliminates the need for a small brooder, thanks, i will give it some thought. i just asumed it would need to go on the bottom because heat rises. and yes hand turning, unless i can rig something (push/pull rolling system?) up till the eggs come. cookyinoz, i tested it with some stones that were egg size and they were the correct temp after 24hrs, (eye test) should i use eggs instead? Yes - stones dont hatch eggs do. But seriously - the texture of an egg is different to a stone. Around here at the time of winter when I was a kid, mothers used to put stones in the wood fired ovens over night for their kids to put in their pockets to keep he warm walking to school. The heat retention properties of stone is very different to that of eggs. i just put in 1/2 dozen sikie x eggs, that should give them 24hrs before i put the barni eggs in, will that be long enough to test and fiddle? will i need to turn the temp down when they start making their own heat? or open up more vents? 2. Adequate humidity - dont worry about absolute values - just make you have a constant supply of moisture in the eggs - something i to is to spray the eggs with a hand held mister - from the $2 shop. If the moisture is quickly sucked into the eggs then its too low - if it lingers more than a minute its about right. If it stays beaded on the egg shell then its too high - its no more complicated than that. 3. Rotation of the eggs - heaps of discussion on that - no need for me to dredge it over again. 4. A good exchange of air - developing eggs need a supply of fresh air as they require oxygen and they also respire carbon dioxide as a waste product. Not enough ventilation and their is a CO2 build up. - too much ventilation and you lose heat and humidity - to little and its the reverse happens. Dont rush, spend time getting it all right and it may take several batches of poor hatchings but its not rocket science - the ancient romans hatched eggs in structure that looked like pottery kilms and were fire heated. o.k, good thing is bator has been maintaining 37.7 and good humidity for about 3 days so i won't touch anything. i promise, i won't touch anything, temp has reached 37 pretty quickly after i put them in, i realise the eggs won't be that for 24hrs. the air vents are down low, hopefully there will be enough. thanks for your help, hopefully it won't take too many hatches to get it right. i have 11 definitly growing in the incubator and 1 growing under my broody, the rest look clear or with a yolk? no blood ring, does that mean they weren't fertile or just didn't start growing? i will post pics after hatch, then i might just put them under the broody if i only get a few that do hatch. 11 days to go, they are due on my son's 6th birthday. he is doubly eggcited. oh, and one looks like a double yolker that is growing, twins, i know it won't hatch if it is. I had twin roosters hatch once. Same egg....They went everywhere together. Cute to watch! It has happened, but 99% of the time it doesnt. You might as well see how it goes. You can always help them out if they Pip but cant get out. yeah raf, i already started on a hatcher after seeing your post. and........i nearly rang to see if you had room in your bator for them, i got a bit chicken when the eggs arrived. 3 started then stopped at various times, ick, one from under the broody also stopped. 12 when cracked were runny, no blood or blobs. do i count those as unfertile? You are coming to the most vital part of this process. And it requires a momoth effort. WIth the foam box one, I found the only really disasterous thing you can do is continue to let the humidity out by opening the lid. Just be patient. Fill the water tray at last turn. They can take more than 24 hours from PIP to hatch. The first chick to hatch can stay in there for 24 hours before it needs to come out and drink. They can take 2 days from first chick to last, sometimes 3. The first chick to pip may not be the first out.